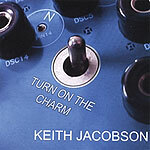 CD review: "Turn on the Charm"
This review first appeared in the Sept. 20, 2007 issue of the North County Times. San Diego's Keith Jacobson plays an uptempo, R&B-informed brand of smooth jazz that has little to do with jazz but everything to do with a bright, sunny sound. More dance-oriented than most smooth jazz, Jacobson's second album grooves along in a bubbly David Sanborn vibe that's at least as much pop as it is instrumental easy listening. Accessible and with enough energy to hold your attention, it's that rare smooth jazz CD that refuses to sit in the background as mood music. Playing soprano, alto and tenor saxophones, Jacobson has a lustrous tone on all three horns. He wrote or co-wrote eight of the 10 songs here. While none of them are as catchy or memorable as his cover of Billy Joel's "She's Got a Way," neither are any of them out and out boring. They're just somewhere in between, closer to good than not, but still not the sort that will get stuck in your ears.